In stock -This product will ship today if ordered within the next 10 hours and 22 minutes. 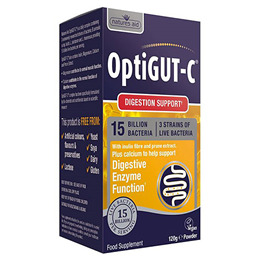 Natures Aid NutriGUT-C is a daily complex containing 3 extensively researched strains of bacteria; B. animalis subsp. lactis, L. plantarum and L. rhamnosus providing 15 billion live bacteria per capsule. NutriGUT-C also contains FOS, magnesium and prune extract. Natures Aid NutriGUT-C has been specially formulated by bio-chemists and nutritionists based on scientific research. Fructo Oligo-saccharides, Microcrystalline Cellulose, Magnesium Oxide, Prune extract, Lactobacillus rhamnosus, Bifidobacterium animalis subsp lactis, Lactobacillus plantarum. Adults & children over 2 years: 1 teaspoon (4g) per day for 3 days, increasing to 2-3 teaspoons (8-12g) as required. Maintenance dose: 1 teaspoon (4g) per day. Powder may be added to drinks, cereals, yoghurts, smoothies, water or taken directly from the spoon. 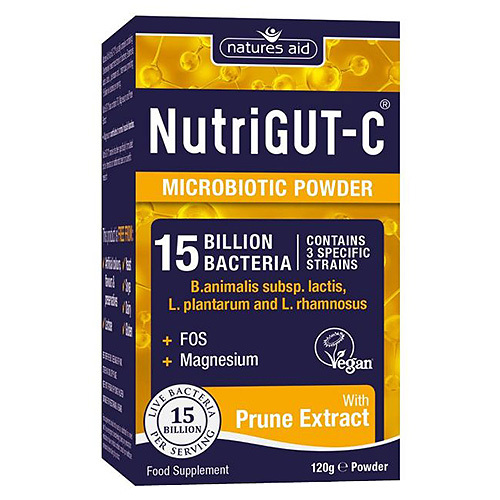 Below are reviews of Natures Aid NutriGUT-C - Microbiotic Powder - 120g by bodykind customers. If you have tried this product we'd love to hear what you think so please leave a review.